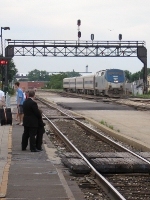 Description: Amtrak 125 is on the point of the easbound Lake Shore Limited at Amsterdam, NY 2/2003. 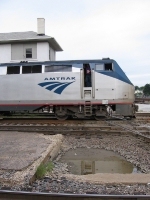 Description: Even AMTRAK nedds help sometime!!!! Description: Toyota's rolling billboard heads to Chicago, from LA, to be put on tomorrow's Texas Eagle. Description: We emerge into the light and see that switcher, lol. We left the platforms at 3:20, right on time. Description: The engineer prepares to swing down to the ground from the cab. Description: P053, Amtrak's Auto Train, is seen crossing over the Lake Monroe drawbridge just outside of Sanford.